How is a galaxy billions of lightyears away connected to us? Is our home nothing more than a speck of blue in an ocean of night? 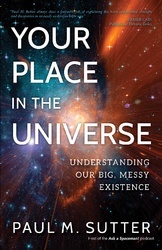 In this exciting tour of our universe, cosmologist Paul M. Sutter emphasizes how amazing it is that we are part of such a huge, complex, and mysterious place. Sutter, host of the Ask a Spaceman! Podcast, breathes life into the science of astrophysics, unveiling how particles, forces, and fields interplay to create the greatest of cosmic dramas. Topics include our place in the Milky Way galaxy; the cosmic web—a vast web-like pattern in which galaxies are arranged; the origins of our universe in the big bang; the mysteries of dark matter; how science has dramatically changed our relationship to the cosmos; and more.